East Shikoku Event: Teaching Young Learners: Issues in Elementary English Education. This event, held in conjunction with the Naruto Education University’s Center for English Education at Elementary Schools, featured a workshop by Stan Pederson on Seven Steps to Success with Young Learners. 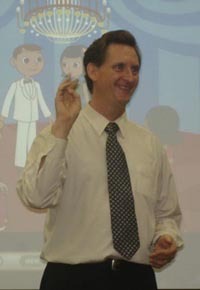 Pederson guided a large group of primary school English teachers through his seven steps, emphasizing song, stories and physical movement all of which encourage self-expression. All of Pederson demonstration activities provided insight into what young learners enjoy and how they learn. The workshop concluded with Pederson noting the importance of the feedback loop in setting achievable goals and assessment standards, noting that assessment for young learners is an area much in need of research in the Japan context. The event also featured two presentations on issues related to elementary school English. Hidenori Ogyu discussed perspective of the jhs teacher in his presentation Starting Junior High School: The Current Situation and what Teachers expect from Elementary School Education. Soukichi Yoshioka presented on Issues in Elementary School English Education from the Perspective of the JTE. The event concluded with a discussion session centering on the need for a better link between elementary and junior high school English education.